Following Packages can be used to check food intolerances to different foods. It measures quantitative IgG responses to 221 foods which include dairy, vegetables, fruits, grains, non-veg, spices and nuts etc. It measures qualitative IgG responses to 59 of the most regularly consumed foods. If the test is positive for any of the food groups in the test, the simple act of removing that particular food from the patient's diet for a period of up to 3 months or more can result in a complete change in the patient's health. Once the symptoms have subsided, the foods can be re-introduced into the diet one at a time. You have been tested against all of the foods listed in your report. As you can see, each food is listed in the red, yellow or green column. Each colour indicates the strength of your body's immune reaction to each food. If you are experiencing adverse symptoms and your test is showing raised IgG antibodies to certain foods, this may indicate an intolerance to these foods. Removing these from your diet for at least 3 months usually results in an improvement of symptoms. 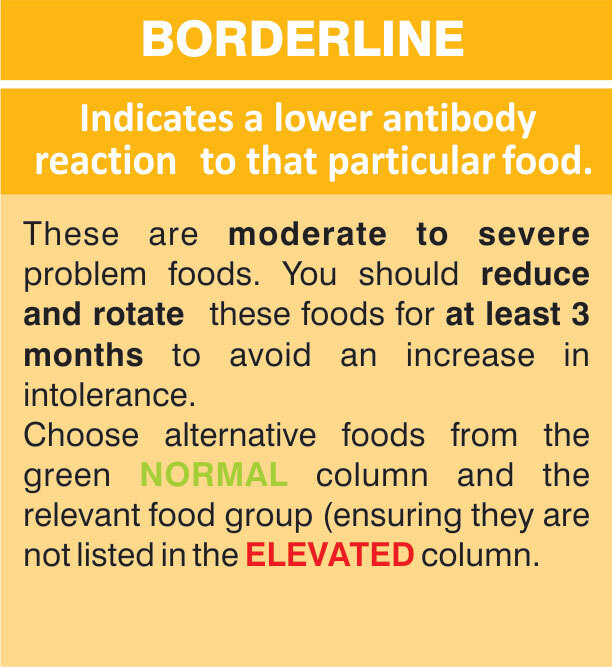 Your Food Intolerance Test results are shown as ELEVATED BORDERLINE or NORMAL and the concentration of IgG antibodies (in U/ml) is shown in brackets after each food. 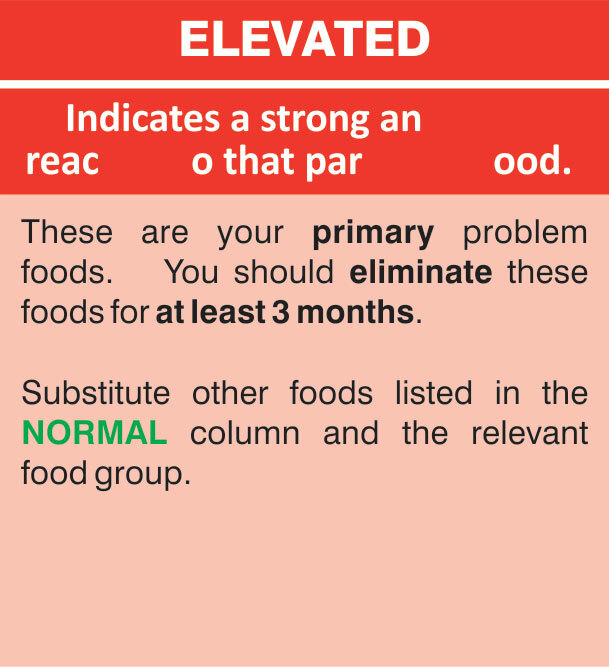 •	If there are no foods in the ELEVATED column, then the BORDERLINE foods should be avoided for 3 months. To rotate foods, you need to eat them no more than once every 4-5 days as the digestive process takes up to three days. For example, to rotate wheat, you could have wheat bread on day 1; oat cakes on day 2; corn cakes on day 3; rye crisp bread on day 4; durum wheat pasta on day 5 etc. •	You may feel worse for a few days after eliminating a food. This is your body dealing with the changes and is experiencing withdrawal symptoms. Be prepared to persevere, as improvements may only become apparent anything from a few days to a few weeks into the diet. •	It is essential that if you cut out a food group, eg milk, you obtain nutrients found in this food (eg calcium) from other foods. •	Do not eliminate one food and substitute solely with another food as you are likely to build intolerance to that food. For example, if you cut out wheat at breakfast, do not swap to porridge oats every day. •	Many people have experienced the greatest improvement when completely eliminating the reactive foods. However, do not worry if you cannot completely eliminate these foods or you need to break your diet occasionally. Just start again as soon as you are able to. 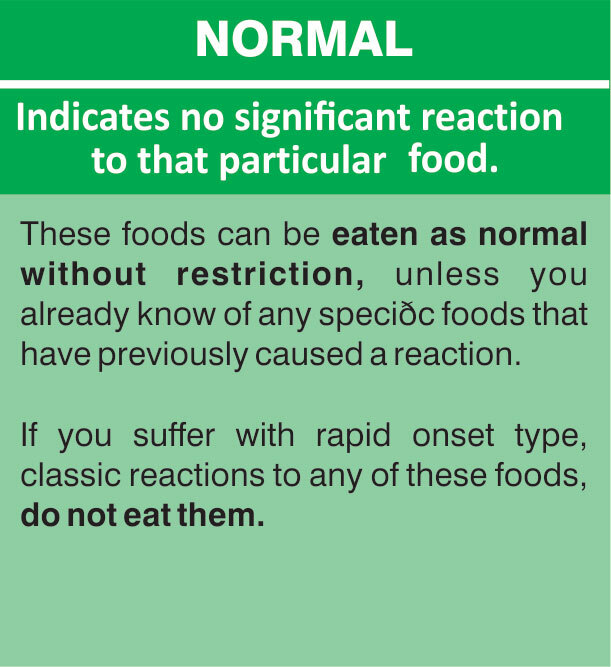 •	If you have been avoiding a food for more than 3 months then it is likely to show a NORMAL reaction. •	If, after changing your diet according to your test results, no improvement has been achieved, then food IgG intolerance may not be the cause and it is recommended that you seek advice from a qualified doctor/ healthcare professional. •	Gliadin is a protein found in gluten which is present in the grains of wheat, barley and rye. Due to the nature of our Food Intolerance Test, gliadin is tested separately from these grains. If your test shows a positive response to gliadin, we advise that you avoid wheat, barley and rye containing foods even if these grains are in the green / NORMAL column of your report.